Vitex agnus castus | Ich bin ein Sender. Ich strahle aus! | I am a sender. I transmit! Based on a photograph by Klaus Staeck, this multiple depicts the props for a performance by Beuys entitled Vitex agnus castus, which he staged in Naples in 1972. 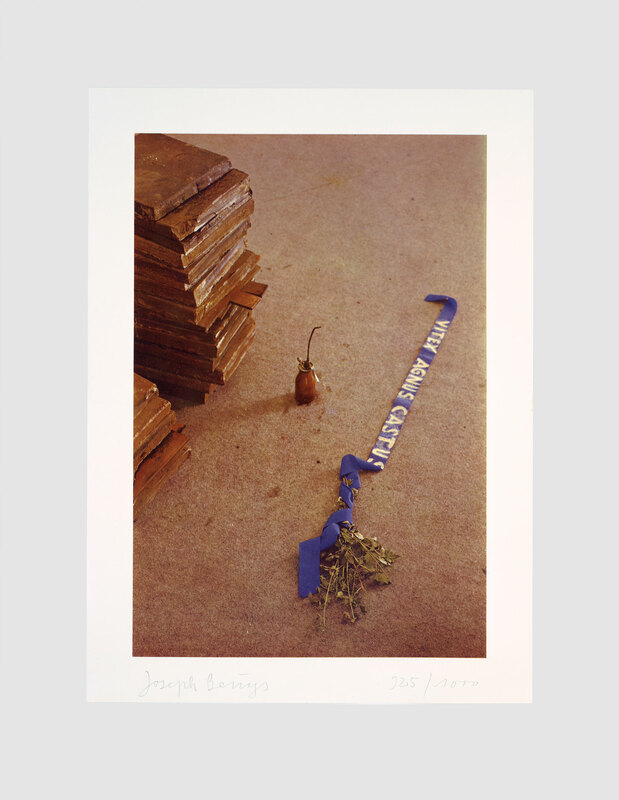 To prepare for the performance, Beuys painted the name of a plant called vitex agnus castus on a length of cobalt blue ribbon. He then affixed this ribbon, together with a sprig of the plant itself, to the back of his hat. Smearing his hand with machine grease, he lay on the ground beside two piles of square-shaped plates, fashioned from a mixture of fat and wax. Amid these piles, he had inserted a number of copper and iron sheets. 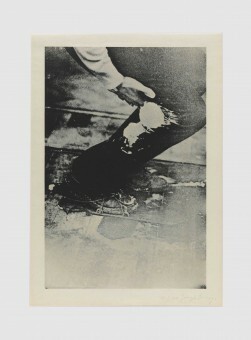 For a period of almost three hours, Beuys remained in his prone position, reaching out to stroke the copper sheets with his grease-covered hand. As time progressed, he seemed to draw energy from the copper, and as he did so his body began to vibrate. In his sculptural work, Beuys often used piles of a single material as a means of accumulating warm energy, the spiritual force that he viewed as the catalyst of change and creativity. By topping these piles with a sheet of copper that could conduct this stored energy, he transformed them into batteries. In Vitex agnes castus, the two piles of plates fulfilled this function. Atypically, however, these batteries were constructed from four materials. 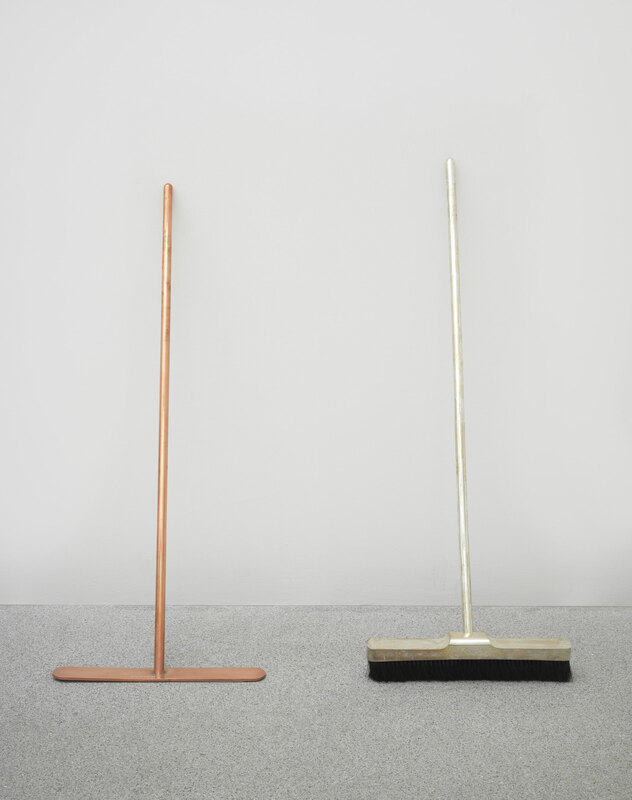 While the copper persisted in its role as conductor, Beuys here made use of three storage substances: fat, wax and iron.1 Of these it is the iron that, together with the copper, proves crucial to understanding his performance. In addition to their energy-related functions, Beuys aligned iron and copper with masculinity and femininity respectively.2 Since each was present in equal quantities in the Vitex agnus castus batteries, they can be seen as uniting the two genders and at the same time placing them on equal footing. 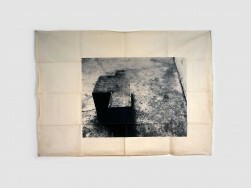 Gender parity was important for Beuys, since he felt that masculinity had become too dominant in modern life and wished accordingly to see femininity accorded greater prominence. His role in the Vitex agnus castus performance was to enact this rebalancing process by absorbing the energies of the copper and iron plates. Affirming this aspiration were the cobalt blue ribbon and the sprig of vitex agnus castus, which Beuys used to mark himself as equally masculine and feminine. The former alignment was expressed through the metal cobalt, another substance that Beuys linked to masculinity. The latter was expressed by the vitex agnus castus plant, which as Caroline Tisdall has noted, was used by the Ancient Greeks to honour the fertility Goddess Ceres.3 By absorbing the energies of his batteries through his grease-smeared palm, he was assuming the role of a more balanced and enlightened human being, in whom the complementary strengths of both genders were united.